Cherry blossoms are in full bloom at Busan Baehwa School for the Deaf in the southern port city on Thursday. 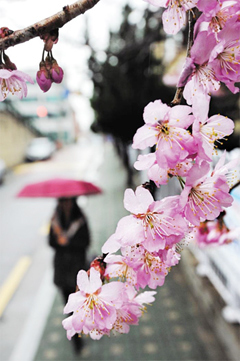 Cherry blossoms are likely to bloom about eight days earlier than last year and reach their peak around April 15 in Seoul. The Korea Meteorological Administration said on Thursday that the trees should start blooming next Tuesday in Seogwipo, Jeju Island, between March 23 and April 1 in the southern region, and between April 2 and 13 in the central region. In northern Gyeonggi Province and the northern and mountainous areas of Gangwon Province, blooms should appear after April 13. The start of blooming is officially declared when at least three blossoms fully open on a tree at weather stations across the country. This year, the blooming period is forecast to begin three days earlier than average. "As cherry blossoms bloom between late March and early April when temperatures fluctuate greatly, the start of the blossom season varies each year," said a KMA official. "We have expected that the cherry blossoms would arrive earlier because temperatures were similar to the average in February but above average for the first 10 days of March."